Mr Stephen Blamey, BSc, MB, BS, FRACS, FACS, is a retired surgeon, travelling to some interesting medical history locations and writing the odd piece for us. 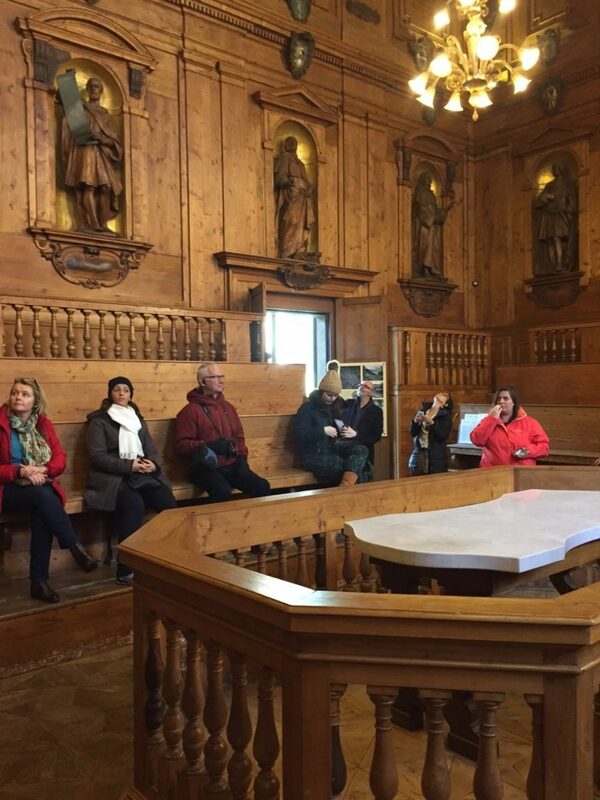 On my recent visit to Bologna, I elected to take a walking tour of the city. 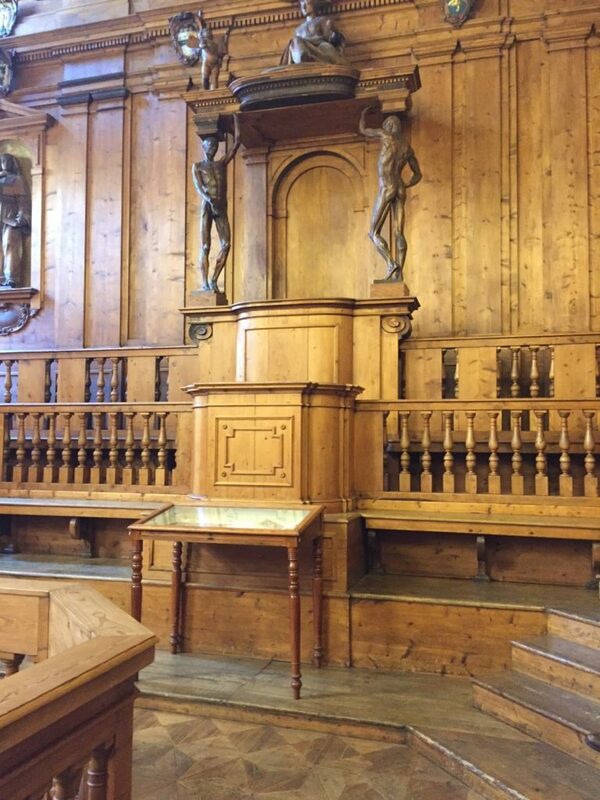 At the outset, I was not aware that this was to include a visit to the famous Anatomical Theatre of Archiginnasio. What a treat; firstly the University of Bologna is said to be the first in the world, founded in 1088 (Oxford maybe about 1096, Cambridge 1209); secondly the theatre itself is an historical and aesthetic delight. 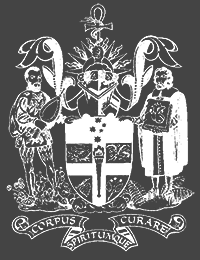 This particular site was built 1636-38 and modified to the current appearance 1733-36 with many wooden carvings of famous medical identities from ancient history. Unfortunately, it took a direct hit during bombing in WW2. The meticulous faithful reconstruction used the original wood and carvings and only a very small proportion is “new”. During the early years, the lecturer sat in an elevated canopied seat, well removed from the dissection table; dissection was undertaken by barbers! The construction of the Palace was commissioned by Cardinal Borromeo between 1562 and 1563 following the project by architect Antonio Morandi called Terribilia; it was to house the lecture halls for University Study (Law and Arts). Up to 1803 it was the seat of the University and since 1838 it has been housing the Civic Library. The room, named Theatre for its characteristic amphitheatre form, was designed in 1637 by Bologna’s artist Antonio Paolucci also known as Levanti, a pupil of Carracci. It was constructed with spruce wood and decorated with two orders of statues depicting, at the base, Hippocrates, Galen, Fabrizio Bartoletti, Girlamo Sbaraglia, Marcello Malpighi, Carlo Fracassati, Mondino de’ Liuzzi, Bartolomeo da Varignana, Pietro d’Argelata, Costanzo Varolio, Giulio Cesare Aranzio and Gaspare Tagliacozzi are featured. Above, twenty of the most famous anatomists of the Studio Bolognese can be found. The cattedra del lettore or teacher’s desk, towering above the desk of the demonstrator, is flanked by two Spellati (skinned men) statues, sculpted in 1734 based on the drawing of Ercole Lelli, a famous wax model maker from the Istituto delle Scienze. Above the canopy a female figure sits as an allegory of Anatomy. A small angel gifts her not with a flower, but with a thighbone. The anatomical room was heavily damaged during the bombardment of Bologna on January 29th, 1944, destroying this wing of the building and was reconstructed immediately after the war, reusing the original wooden sculptures that were fortunately recovered from the rubble.